The lightly hazed golden amber colored beer pours out into a Duvel glass with a 1 1/2” off white head that recedes slowly to become a cap of foam and then a thin irregular island of foam with a ring around the glass while leaving a web and some patches and rings of lacing. Sipping creates a couple of arches with lots of small patches and a few legs of lacing. The aromas are full of citrus and pine with lots of grapefruit, zest and pine resin. There’s also a bit of caramel from the malt. The flavors are much as expected from the nose with the grapefruit and pine resin showing the most. The caramel malt sweetness is a bit more noticeable than the resinous bitterness but each is noticeably present. 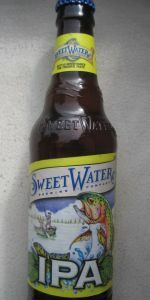 The mouth feel is medium bodied and fairly crisp with the moderate and persistent carbonation. The finish begins as the various flavors and sweetness begin to fade away leaving the long clean fresh ending to some light dry bitterness from the pine resin and citric zest. Overall I’d say this is a well made drinkable classic IPA with sweetness from the malts and the bitterness from the citric resinous hops in a very enjoyable balance. Looking forward to having this one again and I could easily have a second one right now. Pours a rocky slightly off white head. Color is a pretty clear brown-amber. The nose is dank and grapefruity. A slight hint of pine. Some hints of guava after a good swirl. Can't really smell the malt character. The palette is pretty sweet with caramel notes, backed by some biscuit and crackers. Some grapefruit comes through on the flavor, but the flavor is not quite as hop forward as the nose. Finishes a touch dry, washing away some, but not all, of the sweetness. The mouthfeel starts medium bodied and moves to a touch aqueous through the finish. The carbonation is moderate. The alcohol warmth is very subdued. Overall, this is an IPA whos nose eludes to a better palette. It's a perfectly drinkable beer, but the 420 Extra Pale Ale would be a better purchase for the money. Would be tasty with a juicy hamburger or a solid cheese pizza. Pours a light copper color with a finger of head. There is an array of bright citrus fruits in the nose and flavor profile. The finish is solid piney hop goodness. Simple, but a real winner. Great, tasty Ipa. Strong lacing that sticks to the glass. Light, hazy look that is yellowish light brown. Citrus notes. Smooth finish. Pineapple, not very bitter. Overall a easy light body and good finish. Poured into a chilled 16oz glass. Medium head which receded quickly. Opaque hazy orange in color. Nose is grapefruit and a malty hoppy aroma. Mouth is full and robust ending with a slight hop bitterness on the palette on final. Alcohol is present though not prominent, I thoroughly enjoyed this IPA. Had it the first time on tap in the ATL Sky Club on one of my may TDY trips with the Army. Had it while visiting friends in Georgia a few years back. Only had a couple, but was mightily impressed. Our friend still swears by it today for good reason. Have had it once since then, but I really need to revisit.